Former Supermodel Waris Dirie was said to be missing by her manager and police. The author and spokeswoman for female genital mutilation was found on Friday in her native Brussels. We are glad the model was found and returned home safely. Police on Friday found Waris Dirie, three days after the Somali-born model who launched a worldwide campaign against female genital mutilation had vanished. Dirie, 43, appeared to be in good health and was being questioned by police about the disappearance, said Estelle Arpigny, a spokeswoman for the prosecutor's office. Former African Supermodel Waris Dirie who was an outspoken activist against female genital mutilation FGM is missing according to her manager and police. She is the author of the book Desert Flower and was due to speak at two women's rights conferences this week. Waris' disappearance comes a week after model and FGM activist Katoucha Niane's body was discovered floating in the Sienne river in Paris. Our hearts go out to Waris and her family with our hopeful prayers for her safe return. On Friday, Belgian police launched an official missing persons appeal for Dirie, asking the public for information. The police said they also were looking for the taxi driver that took her from the area between 3 a.m. and 4 a.m.
Lutschinger said Dirie had been involved in an altercation at a hotel reception after a taxi driver had taken her to the wrong branch of the Sofitel hotel chain after a visit to a night club. The police were called and drove Dirie around Brussels looking for the correct hotel, after she had apparently forgotten where she was staying. 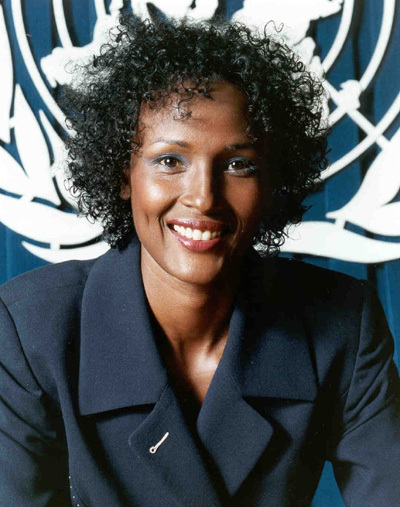 At one hotel, while staff and police were checking for her name on a computer, Dirie walked out and climbed into a taxi that drove away, Lutschinger said police told him.